The Samaria stands above the harbour beach at Chora Sfakion with fantastic views of the sea and the harbour. The sand here gives the sea a brilliant turquoise colour. 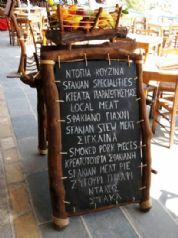 Enjoy a meal or snack from the extensive menu which offers everything from light snacks, such as the local speciality of the area - Sfakian Pies (a pancake type dish cooked with a filling of soft cheese which can be covered with local honey), to a three course meal with such appetizing treats as locally produced Cretan village sausages, chicken fillet with spinach, stuffed artichokes, aubergine rolls, octopus salad, anchovies, baked feta cheese, saganaki, fried cuttlefish and a variety of Greek and Cretan salads to name just a few. To view the full menu please click here. Fantastic sunsets can be enjoyed from the Samaria's terrace and the view as you descend into Chora Sfakion along the new road from the north, is magnificent as you follow the course of the Imbros Gorge. 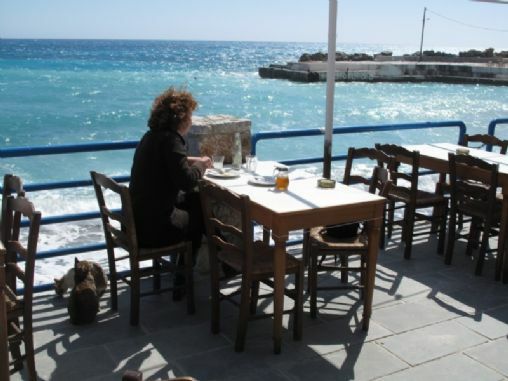 It is well worth making a special trip to Chora Sfakion if you're touring Crete independently but if you're travelling back from walking the Samaria Gorge, why not ask your tour operator if you can stop over for a meal at this lovely south coast town. 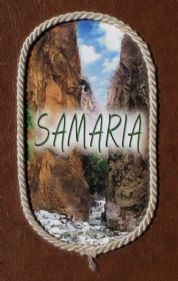 You'll receive a very warm welcome at the Samaria. 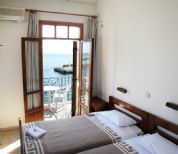 The Samaria also has rooms for rent with excellent uninterrupted sea views. 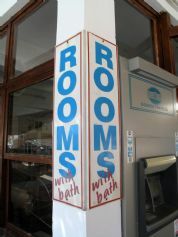 Further information on the rooms will be available soon in our Accommodation Directory and on our Chora Sfakion page.